I was meant to go running today so the recipe I selection came from Runner's World magazine. I was sold by the title 'Fight Fatigue with Mac 'n' Cheese. I'm invariably tired and the idea of mac 'n' cheese seemed quite an appealing treat after pounding out a few miles. Sadly the run never happened as I was awake from 1am and was just thinking around 5am that I'd probably be best getting ready to run when I must've nodded off until my toddler alarm clock woke me. Today is one of those mad-busy days when I'm trying to juggle lots of things. In an hour or so I'm going to hit the road to Southampton to my cousin's 21st. It's a fancy dress party so I'm hoping to leave early and get changed 'darn Sarf' rather than having to drive across Salisbury Plain dressed as Cruella de Vil. 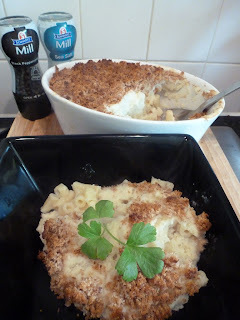 As there's only party food, I figured I could probably still get away with the mac dish and as I've not had much sleep, I could test it's fatigue fighting (gimmicky) claims. I'm driving back home again tonight. Mad, I know but I have to be back for Miss A. It's an interesting recipe that uses cauliflower as the base for the white sauce instead of a traditional roux. As a fan of cauliflower cheese, it seemed like an ideal dish. And with a bit of work (or maybe if I paid attention to the recipe rather than my sofa-diving child) it could be really tasty. There was also too much cheesy topping to fill my dish. It's kind of like a cauli soup that you put on top and I was worried that it was a bit thin, but after baking, it had thickened up nicely. I may reduce the stock a bit next time so that the cheesiness is more intense. I also forgot the mustard, added a pinch of cayenne to the cheese sauce and put the parmesan into the cheese sauce by mistake rather than sprinkling it with the breadcrumbs. I reckon this is a better solution and the breadcrumbs would be good with some fresh herbs mixed through instead. It was REALLY filling. I thought when I was making it that I'd be able to easily eat the lot, but one portion and I'm absolutely stuffed. I know what I'll be having for lunch tomorrow. So a short blog today, and they will be much shorter over the coming weeks as it's back to work Monday Was that a collective sigh of relief I heard blog readers? Cook the cauliflower in boiling salted water for 25 minutes. Remove from the pan with a slotted spoon and set to one side. Cook the pasta in the cauliflower water for five minutes. Drain and rinse to cool; put the cooked pasta in a greased baking dish. Blend the cauliflower in a food processor with the stock, both cheeses, cayenne, salt and pepper. Pour the sauce over the pasta. Top with breadcrumbs and season with a little more black pepper. Bake for 20 minutes.